I’ve been reviewing way too movies of Jim Carrey’s that I have seen countless times. It is time I review something that neither I nor many others have seen, no matter how much of a fan we are. 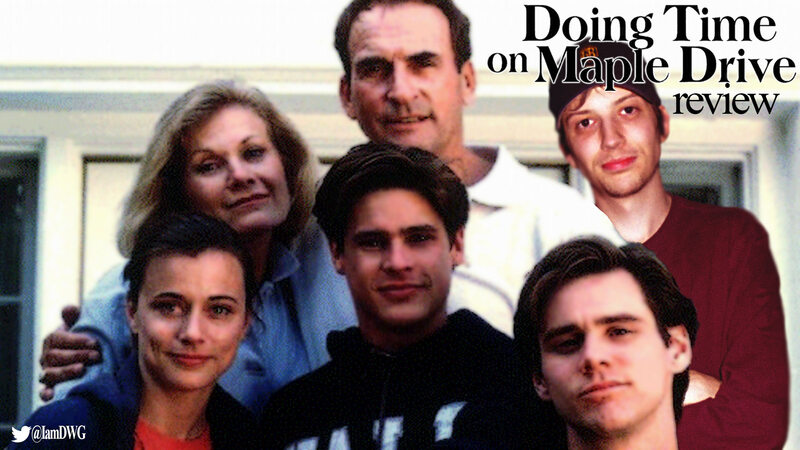 Digging deep, I was able to track down a made-for-TV movie called “Doing Time on Maple Drive”, one of the first movies (if not first) that Jim Carrey ever sported a serious demeanor, and you know what? He actually did very well acting-wise. This film centers around a family as they get together to celebrate the engagement of Matt Carter (William McNamara) and his fiancé Allison (Lori Loughlin from Full House). They all meet up at his parents house played by James Sikking and Bibi Besch. Also at the house is his brother Tim (Jim Carrey), sister Karen (Jayne Brook), and her husband Tom (David Byron). Throughout the events of the film, you realize that this has so many instances revolving around the man versus self conflict. This is because the entire family is extremely dysfunctional. Each member growing up had the misfortune of growing up in their fathers footsteps. Their father was a very stern and strict man who never ceased judging his children, wanting them to be the best they could possibly be, he just had no idea about how that affected them. Thanks to the father, Tim was an alcoholic, Karen was so worried about having children with her husband and having it grow up in that situation that she was willing to abort it without mentioning it to her husband, and the groom-to-be himself was a closeted homosexual that was so scared of the judgments that he was willing to take his own life to escape it. Some of you may already know this, but I despise TV movies, but there was just so many important messages thrown in throughout the film that it is hard to overlook. Not only that, but the film was surprisingly put together well in regards to all the different scenarios. So many different things can easily feel jumbled in a Hollywood-caliber film. So the pacing was well put together but what else? The acting was very impressive for a made-for-TV film. I was impressed by all the key characters in this film putting on a heck of a performance, including Jim Carrey in one of his first dramatic roles. I was genuinely impressed all around. It was also very realistic, we all know that many families have the misfortune of dealing with judgmental parents and dysfunction in the family to know that these types of things happen. Thankfully, they didn’t try too hard and come off as tacky. Here lies the problem: it is a TV movie. There are just some things that they cannot escape from. I have to scrutinize on the fact that it is fullscreen, I have to. I have to mention that the lighting in the film is horrible, and the cinematography could use a great deal of help. I have to mention these things because no matter how unimportant they are to the overall story, they are extremely important for how it is presented. The music is tacky as well, but again, that would be expected for a TV film like this. The fact of the nature is that these negatives ultimately give off a general feel that is often subliminal when watching. That feel is…amateurish. It really is. So it doesn’t grab your attention like it should. Honestly, I only watched it because Jim Carrey was in it, and that was the sole reason. Had someone else been in it entirely, it could have been missed by me, as well as several others. An actor shouldn’t be the reason for someone to watch a movie.